The Cold Salt Hydrotherapy Spa is used to treat and prevent a multitude of injuries. » Prevention: Nick and the team use the spa routinely to prevent lower leg injuries and reduce swelling after strenuous exercise. » Cure: The spa can be used for all forms of lower leg inflammation: removing the painful fluid swellings associated with injury. Nick says “In the short time I’ve had the spa, it’s proved invaluable. Not only in speeding up and improving recovery when ailments arise, but in keeping the legs of my competition horses in the best shape possible to help prevent future incidents”. 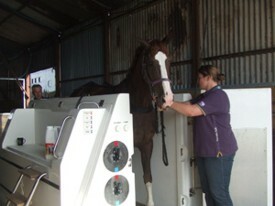 Manufactured by ECB, the worldwide leaders in Equine Spa manufacture, the Cold Salt Hydrotherapy Spa is used to treat and prevent a multitude of injuries. The treatment temperature alone (2°C/35°F) induces a massive rush of blood and a circulation rate which otherwise would not be present thus effectively reducing swelling and increasing mobility in the limbs before and after training and competitive events. We have a dedicated team of professionals available around the clock to help rehabilitate your horse, we have a horse walker, the spa, flat Martin Collins Gallops, and plenty of scope for walking out in hand or under saddle. We are always happy to try to work to yours and your vets requirements where time or facilities might make this difficult at home. Short or longer term Rehab Livery taken. Please note that horses and ponies will be required to wear a bridle or chifney whilst using the spa and that spa sessions will be managed by a member of staff at Chescombe Farm.